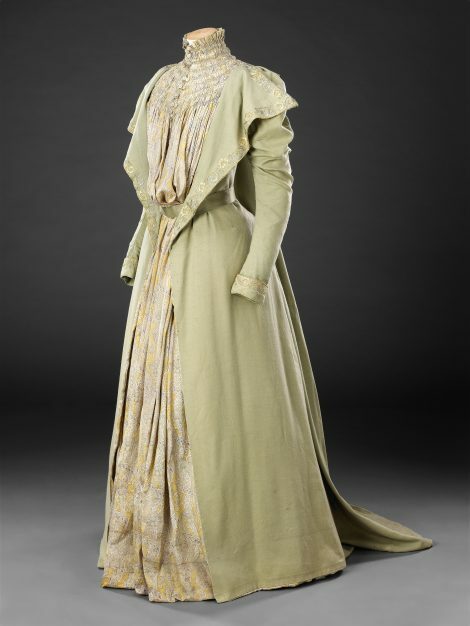 The tea gown was an informal style of late 19th and early 20th Century dress, designed to be worn for domestic occasions such as entertaining friends to tea. 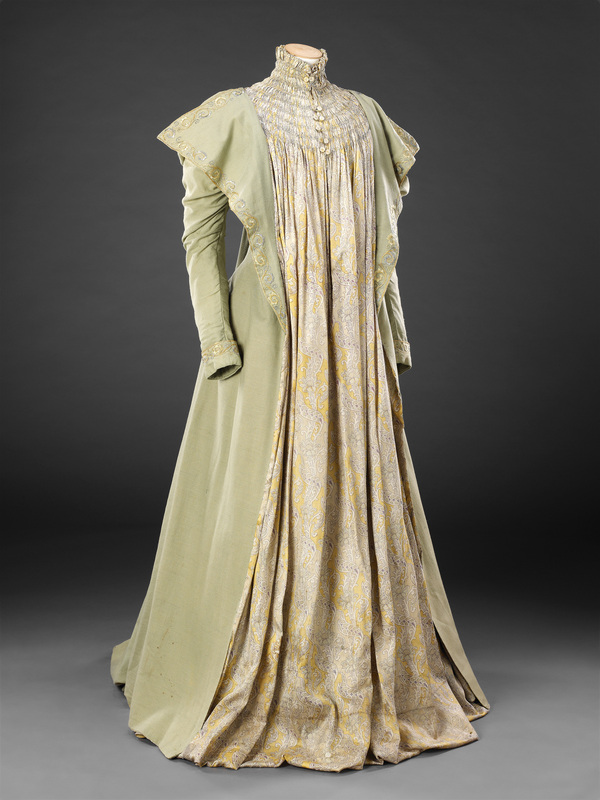 The characteristics of Aesthetic dress (part of a wider movement in the fine and decorative arts) which these gowns tended to incorporate can be seen in this example: a style based on medieval or classical dress, loose in appearance, made from fine soft fabrics in subtle colours, and embroidered in distinctive stylised designs. 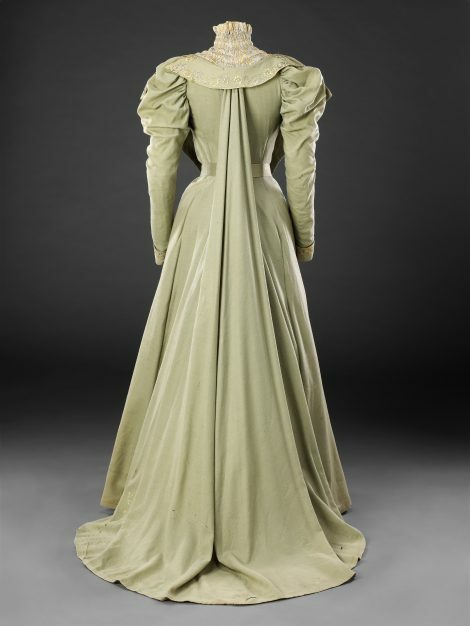 In theory, at least, tea gowns could be worn without corsets, giving rise to Punch cartoons suggesting that this lack of support resulted in bad posture. 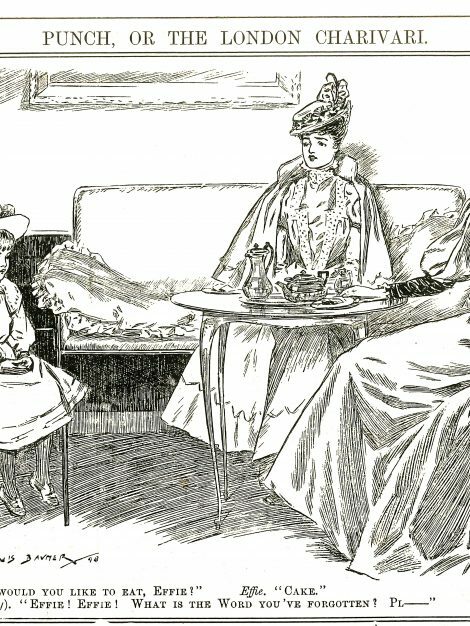 The informality of a hostess’s attire would have formed a strong contrast to that of her guests who, following the etiquette of the time, took tea in their hats and formal afternoon dress. 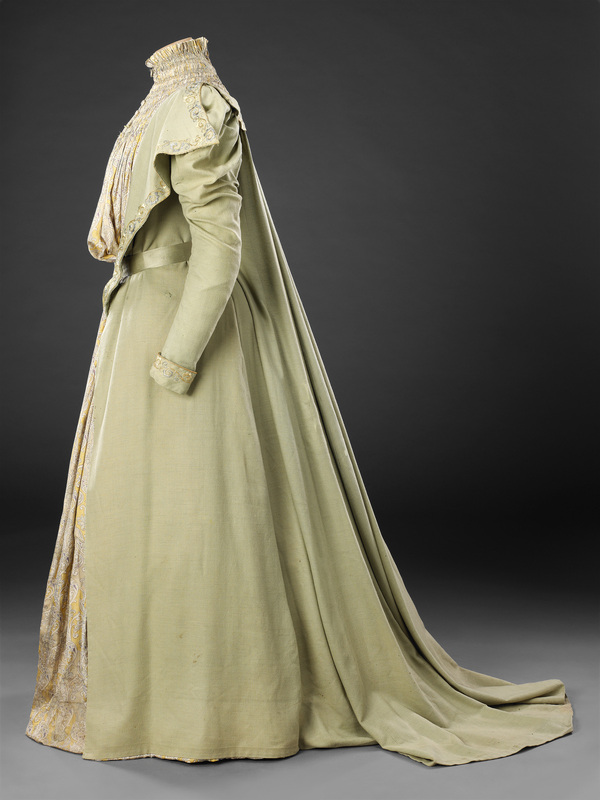 This tea gown could be worn loose or belted (Additional Images show it drawn in with a reconstructed belt). 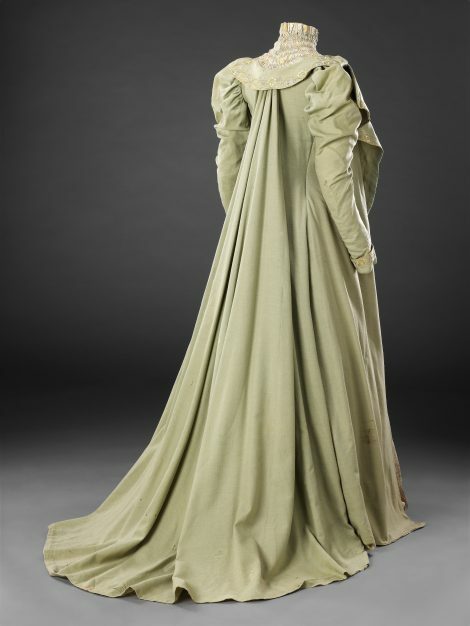 However, the more fashionable flowing option gives a misleading impression of ease, as the bodice and sleeve linings are fitted to the body and the bodice lining is boned. 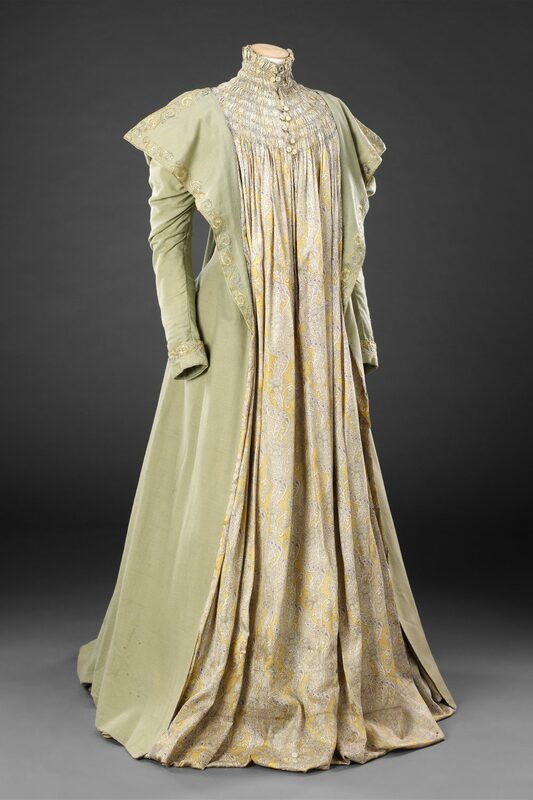 The gown is close in style to examples produced by Liberty at this time, although it cannot be attributed to the company. 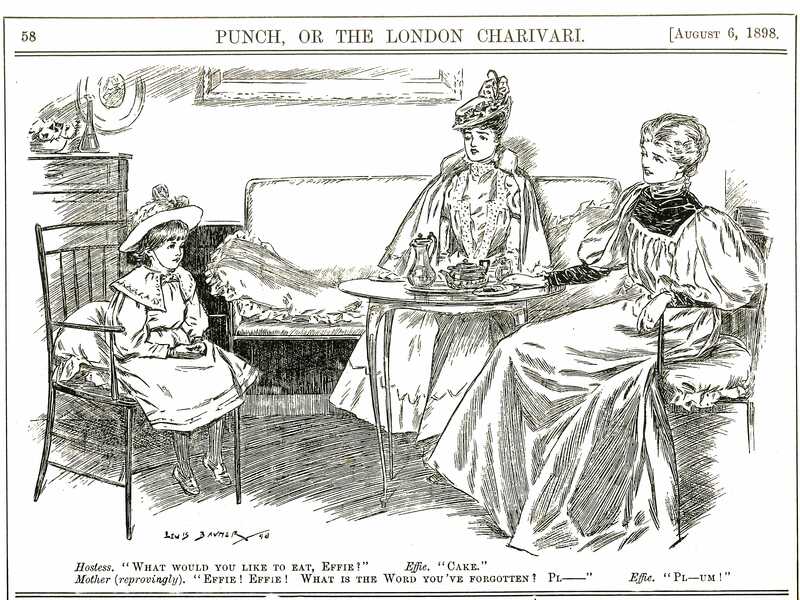 The first, of August 6th, depicts a young woman in a loose, but belted, gown, entertaining a friend and her daughter who sit eating tea in their hats and outdoor clothes. 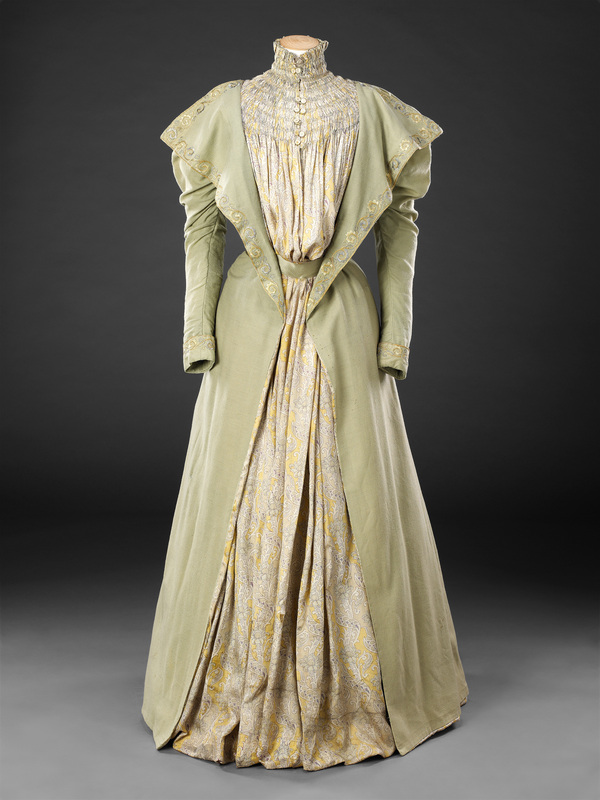 The child’s dress is of a picturesque style inspired by the illustrator Kate Greenaway. The simplicity of the interior and the rural style of the chairs suggest that this is an ‘artistic’ home. 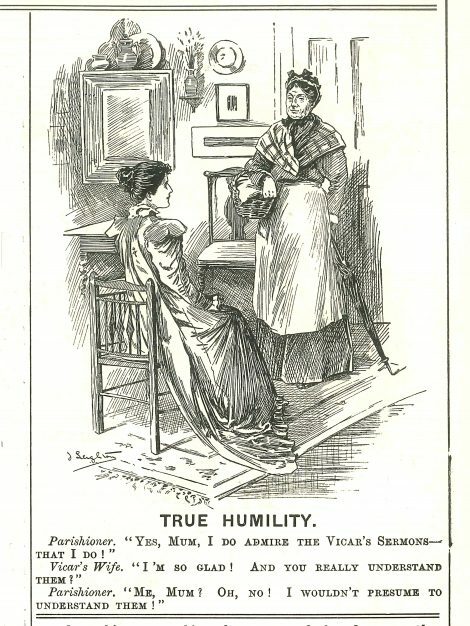 The second cartoon, of December 3rd, shows a vicar’s wife, in her sitting room, wearing a tea gown which has a flowing back similar to that of our gown. These were sometimes referred to as ‘Watteau’ backs, after the 18th Century French artist who painted his female subjects in their loose gowns from behind.